In March, all of the original EMU members have at least reported headline inflation indexes except Austria which is left out of this table. What we see is that, as of March, Germany, the country traditionally running the lowest inflation rate in the EMU, has only three countries Belgium, Spain and Luxembourg, running higher inflation rates than Germany in March. The pace of Greek inflation is even with Germany's. Running lower inflation rates are Portugal, Italy, France, Finland, Ireland, and the Netherlands. The HICP pace for the EMU as whole is at 1.6%; unusually it is a pace below the inflation rate for Germany. What gives? The financial crisis and its aftermath turned a lot of trends on their heads. Since January 1999, the German inflation rate has been higher than the EMU inflation rate only 27% of the time. But since May 2013, it has been higher 87% of the time. Prior to May 2013, the German inflation rate had been higher than the EMU rate only about 10% of the time. But with the onset of austerity, countries that used to be high inflation countries were forced to slow down and to restrict debt accumulation. The debt and deficit rules of the EU Commission came to be enforced more closely. And with that, inflation in the euro area began to slow and often because of inflation dynamics outside Germany. Part of this has been the healing process of the euro area itself. The euro area had developed great internal price disparities. When the single currency area was formed, there was one last-minute (for some, a shocking) set of devaluations to try to get currency-adjusted price levels at the right 'parity' then the EMU internal rates were set and locked. From that point forward, each country was on the same currency scale, and from that point forward, differences in national inflation rates would no longer be able to be compensated for by currency realignments. 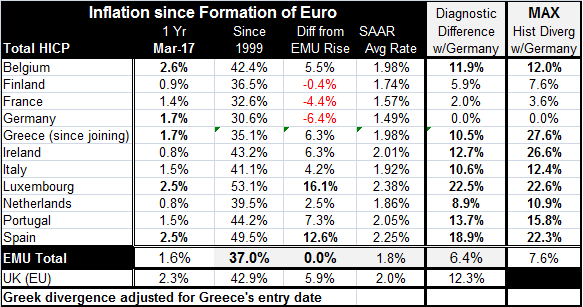 From January 1999 to date, we can see that price level divergences between Germany (that has had the least price level inflation of the group) and original members have had bulged as large as 22% to 27% in four countries: Greece, Ireland, Luxembourg, and Spain. There have been double-digit price level differences for Germany vs. Portugal, Luxembourg, Belgium, Italy, and the Netherlands. Only France and Finland have kept their largest price level divergences vis-a-vis German below double digits. The price level 'diagnostics' for today find only one country Luxembourg with a divergence with Germany of 20% or more. However, Spain still has a nearly 19% divergence, so it has not strayed far from the 20% club. Greece and Ireland have cut their respective divergences in half or better to improve their competiveness with Germany. Portugal and the Netherlands have made some bare bones improvements along with Belgium whose situation is basically unchanged. Finland and France, having always run a tight ship relative to Germany, have tightened things up even more recently. The end result is that on a price level EMU-weighted basis, the divergence of prices with Germany has fallen from a worst of 7.6% to 6.4% in March. Note that individual countries 'worst' performances occurred on each country's own timeline, so what we present in the table is the actual worst divergence for EMU prices, not the theoretical worst-of-the-worst. The results for core inflation rates (not yet available for March) show much less divergence but tell the same basic story. One of the reasons that the ECB has a hard time making polity is that ECB policy is one-size-fits-all and price levels in the EMU have grown at significantly different rates since the currency union was formed. Note that relative to a 2.0% standard for EMU inflation, most countries are now compliant or close. Only Luxembourg and Spain have average inflation rates that have 'averaged' much higher (2.38% and 2.25% respectively). Portugal at 2.05% has been barely excessive and Ireland at 2.01% also has had a toe on the line. The reason for Germany's large competitiveness gap is not because the rest of the members transgressed so badly, but because Germany sought out even lower rates of increase than what the EMU parameters demanded. Germany averaged a compounded inflation rate of 1.49% and to stay close to it, France averaged 1.57% and Finland averaged 1.74%. Currently the rise in oil prices has shot inflation higher across the euro area, but as oil prices have stabilized and back tracked so has headline inflation. In fact, inflation rate trends are so much on the back of oil prices one wonders what these inflation rates have to do with monetary policy. Until recently, the Germans were all but pounding their shoes on the table at the ECB meeting to get attention paid to the rapid rise of inflation. Mario Draghi's position has been that inflation is well behaved and that the price level rise has been due to oil. As oil leveled off and dropped, the correctness of the Draghi position has shined through and German dissent has withered like a hotdog left too long in a too hot camp fire. In the U.S., the Fed is still treating this bit of policy Trompe l'oeil as an oil painting that is correct, even though the degree of headline inflation is not shared by the rest of the index and may be affecting the rest of the index. U.S. core inflation and headline inflation rates have slowed as oil prices have slowed their rise. U.S. wages are not being pushed up at all by low U.S. unemployment rate and the headline push for inflation has all been oil prices. Still, the Fed has been happy to ride that pony as a sign of policy success and near nirvana as it prepares markets for an end-game ride to normalcy including addressing its bloated balance sheet issues. However, the record is quite clear that oil may dress inflation up, but that does not mean that you can take it out. Inflation forces are still well-contained. When central banks use a distorted result to run or to justify policy, that is a danger sign. In Europe, the Germans have been silenced by the sudden slowing for inflation after it had ratcheted up so quickly. But in the U.S., the Fed continues to ride this wave of 'optimism' as it touts that it has achieved its policy goals. Has it really? The IMF has been referring to better global growth. Today the ADB pointed to a brighter outlook for Asian growth. There continues to be some waning concern about what will happen to global trade even as Donald Trump takes his foot off the throat of free trade having made his point about how serious he is. No one wants a trade war. But the U.S. does want fair trade. And finally that argument is getting some attention. But it is unclear how that will impact global growth as it is unclear how growth will develop in each of the various important global growth centers. And the performance of oil prices muddles the picture. Policy will be constrained by reality. We see its impact in Europe. But the U.S. is still riding the Salvador Dali express arguing that the clocks really are melting but don't worry they are still telling the correct time. Are they? Is U.S. inflation as 'revived' as the Fed thinks despite all the surrounding anomalies? Is U.S. growth as steady and stable? Will the U.S. economy be able to hold up and prosper under the strain of the policy path the Fed is now laying out? These are going to be increasingly important questions for the U.S. and for the rest of the global economy as we move toward and past midyear. So perhaps it is a good thing that today we celebrate 200 years of the rollercoaster invention (here). We just hope that policy does not have to ride one for the duration of 2017. What it does or not will depend on the evolution of growth and inflation, not on some contrivance of it.